Sequential order, or process writing as it is sometimes called, is when information in a passage is organized by the order in which it occurs. This method of organizing text is generally used for instructions or directions, but it can also be used to explain processes in nature or society, such as how a president is elected. Sequential organization is frequently confused with chronological order. To further confound the issue, sometimes people refer to chronological order as chronological sequence. But there is a key difference that distinguishes the two patterns: texts organized chronologically occur at a specific time and setting, whereas texts describing processes or sequences do not occur at any specific time and place. To elaborate, if I tell the story of how I came home and made cookies, that information is organized chronologically. The story took place in my kitchen sometime in the past. Alternately, consider instructions on how to make cookies. When did that occur? That could happen at anytime or no time at all. 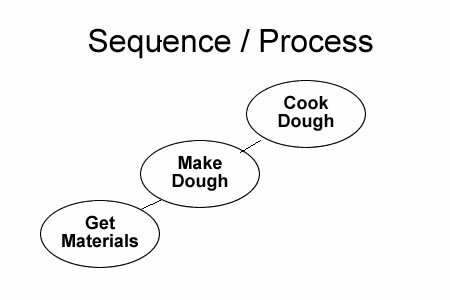 This is because a recipe describes a process or sequence, one which is not attached to any specific chronology. Unlike chronologically ordered texts, information organized sequentially does not occur at any specific time but, rather, anytime. Example: How to Make Cookies. First, get your materials. Then, make your dough. Lastly, cook your dough at 400 degrees for 10 minutes. I’m still struggling with the chronological versus sequence. When a student summarizes a short story (in this case a fairy tale), is that summary chronological because the events happen in order from beginning to end? Or is it sequence? As I define it, and other people use these terms differently, events that occur chronologically occur at a specific time. Whereas sequences or processes can occur at anytime. This is the difference between telling my friend about my trip to the mall (occurred at a specific time and is organized chronologically) and telling my friend how to get to the mall (could occur at anytime and is organized sequentially). I hope that this helps! Very helpful hints. Keep on publishing.